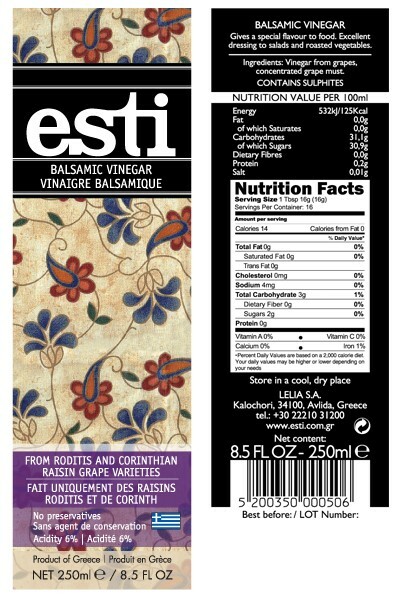 esti Balsamic Vinegar is produced from Roditis grapes, an ancient indigenous variety that grows in mountain slopes of Aigialia - and also from the legendary Corinthian raisin-. The result is a well - balanced balsamic vinegar with sweet cherry notes leaving an aftertaste of red fruits. esti Organic Balsamic Vinegar is produced from Greek organic grapes of the Agiorgitiko variety which is cultivated in organic vineyards of Nemea. A superb balsamic vinegar with bright acidity combined with a very evolved flavor profile that brings out both a rich fruity, and a wonderfully balanced sweetness that makes it memorable. Exquisite.